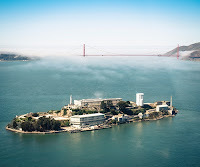 San Francisco - A Chance Trip to Alcatraz And A Bicycle Built For Two! Day 2 in San Francisco dawned every bit as beautiful as day one. It probably ended up having a lot more wind, but that was only an issue if you were truly out in the open. Most of the time, you're between buildings with lots of other tourists around you, so it didn't factor in. This is a day we almost learned a hard lesson. When we first planned this trip, I didn't want to book a lot of things ahead of time as I wasn't sure what weather we would be dealing with. Let's face it, who wants to be out on the harbour or on an open tour bus if it's pouring rain. As we checked the weather report on Friday, it showed Saturday would be sunny and then it would start to cloud up by Sunday. 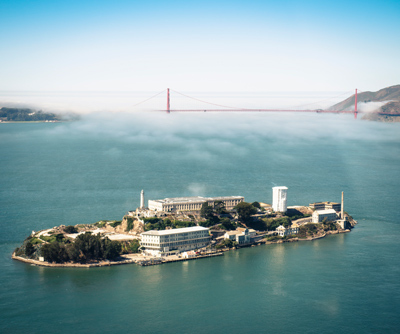 Given this prediction, is seemed Saturday would be the best day to take the tour out to Alcatraz. It was a weekend and prime season, so we figured we had better get up early and catch the first boat to be safe. Panoramic view taken on boat from Bay Bridge on left, past the Golden Gate to Sausalito on the right. Our first stop on Friday morning was an attempt to find a Starbucks by memory from last night's computer search. We totally failed. So we headed over to the ticket booth around 8:15. Imagine our surprise so see a sign saying SOLD OUT UNTIL JULY 8. This was only June 22nd. How could that be? Throwing caution and our pride to the wind we meekly went up to the booth and asked if there was any way to get on the tour. Fortunately they actually did have just a couple tickets for the 10:30 sailing. That shot the day's schedule in terms of what we had originally planned, but we felt very grateful to get tickets at all. Since then we've had several people express shock at our last minute tickets, so lesson learned. I do think there are blocks of tickets out at some of the private tour companies to be sold with their package deals, but to get them from the main source, book them well ahead of time. Now with an hour to kill, we headed back to the hotel to get our safe fixed - turns out the batteries were dead - and look up where that Starbucks was on the computer. It was all a waste of time in the end. When we finally got there the line was 25-30 people long. There was no way we would get coffee and make it to the boat on time. Sometimes you just have to laugh. Alcatraz was recommended to me by several people and they were bang on. We had a beautiful ride over and a nice walk around the island, but it was the audio tour inside the prison that really made the trip worth it. It was narrated by 6 former guards and 6 former prisoners. When they told stories about specific events that happened, their personal experiences made it feel very real. 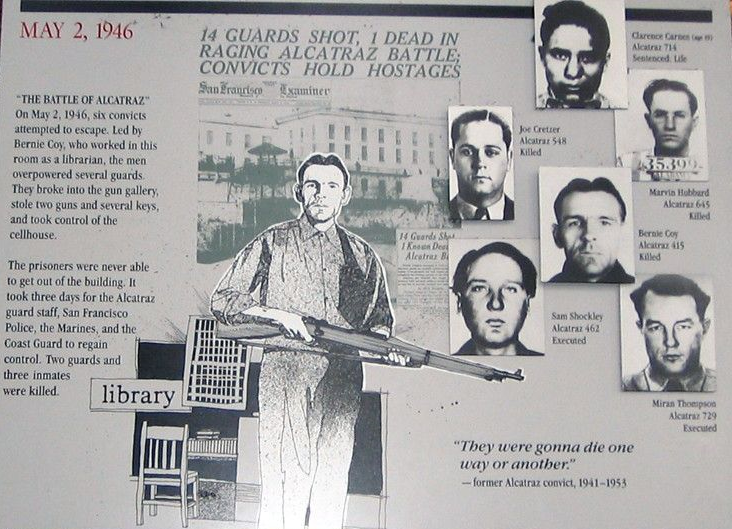 They were there at the time and a part of it, so the prison's history came alive for me. I took lots of pictures inside to help me remember all I learned. It all starts with long cell block corriders like in the image above. Cells are along the right and left and 3 tiers high. It was all very metallic and concrete, so the din must have been constant. A guard would enter the cell block and then, to prevent the possibility of escape, immediately tie their keys to a chord that was raised by a guard on a safe walkway above. If you look at the image on the right carefully, you can just see where the keys are hanging from the chord. This had to be visually hard for the prisoners desperate to get out of there. 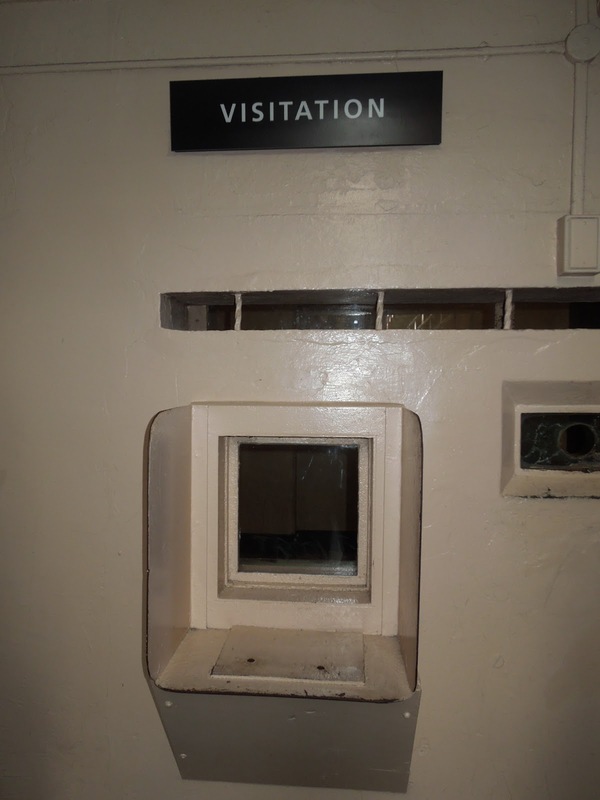 The cell blocks were not warm appealing places, they were bare bones and ugly. When prisoners first arrived they were allowed nothing in their cell in terms of decorations. As you earned points for good behavior, you earned privileges. That would include having things in your cell to do time-passing activites such a painting like the inmate above right. Finding something to do was always a challenge. 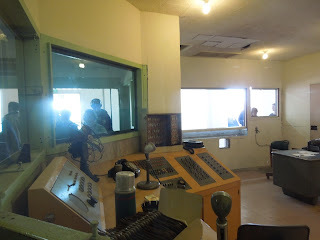 The inmates had access to radio through that box on the left above. I have no idea exactly what they plugged into one of those 2 holes or if each was a different radio station. Going out in the concrete yard also offered a much needed break. 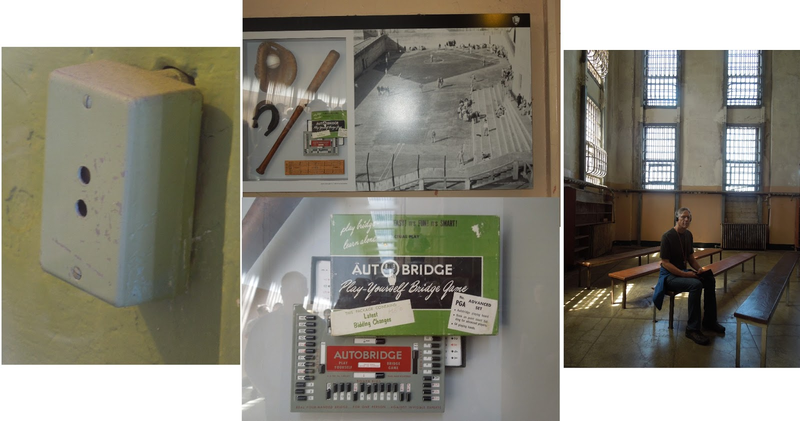 There they played sports such as baseball and a game I have never heard of - Auto Bridge. According to a former inmate, this game was such a passion prisoners would sit outside for up to 3 hours in the freezing cold just to play. Another opportunity that came as you earned points for good behavior was was to be able to visit the library - image on right above. Pretty bare bones. The opportunity to have visitors kept many in line, but I didn't get the impression it happened often. Many prisoners shared that visitors were not that common as even getting to the island was complicated. Just look at that small, uninviting window. Totally inadequate in my mind for 2 people to connect. Never a chance to even touch a loved one. On the right above is the former control room for the prison. For those who could not conform, there was solitary confinements. The cells look bigger and nicer, but they had a nasty feature. The guards could close all the doors and shut the light off leaving you in utter darkness. While this was supposedly against regulations, it happened. One former prisoner shared to pass the time in the darkness and keep from going crazy, he would toss a button, search until he found it, then toss it again and again. It was the only thing he could think to do without any light. Eating was another distraction, although not always a happy one. You can see how bleak the cafeteria is on the left. The kitchen was actually large and fairly well laid out. My favourite story from this part of the audio tour was the spaghetti fiasco. The spaghetti was originally quite good but over time deteriorated to the point the prisoners were not happy. One finally decided the next time it was served the tables would turn over. Sure enough, the prisoners started to create havoc but it was quickly quelled. One guard slowly broke 3 windows one after another to get there attention and then loudly cocked his gun. Every single prisoner knew that sound and one and all immediately stopped and at the signal, returned to their cells. Every prison has had their escape attempts and the sheer creativity of the prisoners is astounding. Alcatraz is listed as having no successful escape attempts, but no one is really sure as there were a couple of prisoners who were never found. They are assumed dead. Surrounded by very cold water is the number one defense. One prisoner who actually managed the swim to shore was found clinging to a rock along the far shoreline in serious hypothermia. The couple never found supposedly left the island in a small boat created from a raincoat. The above photos show a homemade bar spreader on the left. The middle and right photos illustrate how some prisoners supposedly escaped their dells. They removed the toilet from the wall and supposedly chipped away the concrete with a stolen metal spoon and crawled out. Other prisoners question how they could first of all carve concrete with a kitchen spoon, and secondly do it without the guards finding out. It would be a slow and loud process. During one escape that escalated into a standoff, the prisoners were holed up in a specific area of the cell block. A hole was drilling in the roof above them and a grenade dropped in. You can still see the hole in the roof and the scarring on the floor from the blast. After we finished the audio tour we walked around the outside. It really quite beautiful. There were decaying buildings that formerly housed all those working on the island. Administrators, guards and their families resided here. There is a large group of volunteers who maintain the gardens you see. I also loved seeing how nature foudn a toe hold on it's own in the most unlikely places, such as the small bit of foliage growing out of a drain hole for rain water in the brick wall below. There are also tons of nesting birds. In June there were baby birds to be seen everywhere. Can you see the 2 small, gray balls of fluff with the seagull in the image on the left below? In the middle is a bird who had nests well-hidden in the trees. I couldn't find a way to get a pic discreetly. On the right below, that large group of black birds have many females sitting on nests mounded on the concrete. It was surprising to see them in such a visible location. I assume by late July/early August the babies will be all grown. When we returned from the island it was time for a late lunch so we headed back to the outdoor patio of Jack's Cannery Bar for a cool brewski and some great food. I was seriously hungry. The only downside was we didn't manage to snag a table in the shade this time - thank goodness for sunscreen. Then after some downtime we decided to indulge one of Glen's favourite past times - bicycling. He bicycles to work every day, but I haven't done it in years. A tandem bike from Blazing Saddles Bike Rentals offered a chance for us to ride together. While they have several locations, we started at Pier 39 and road along the waterfront path all the way to the base of the Golden Gate Bridge. It was pretty easy getting there, but near the end coming back there were a few blocks we ended up on the road with the cars. No worries, we just walked from there. For more serious riders you can actually go over the bridge all the way to Sausalito and then take a ferry back to the pier. If I was a better rider, I would do this in a minute. If you're interested in the self-guided bike tours offered by this company, you can check them out at - http://www.blazingsaddles.com/san-francisco/maps-and-rides/san-francisco-self-guided-tours.aspx. And so ended day 2 of our mini-trip to San Francisco!